Gemini Carnival Club will be collecting waste paper and cardboard throughout Ilminster on Saturday 27 April. Please put you waste paper and cardboard (folded flat) at the kerbside from 9am. Please label it with "For Gemini Carnival Club Collection". Somerset County Council in exercise of their powers under Section 14 of the Road Traffic Regulation Act 1984, as amended, and of all other enabling powers hereby makes the following Order. The Order will come into operation on the 14th March 2019 and will remain in force for eighteen months. The works will commence on the 20th March 2019 for One day The restriction will apply when indicated by traffic signs. (ii) Police, Fire and Ambulance emergency service vehicles. (iii) Vehicles falling within regulation 3(1), 3(2), 3(3) and 3(4) of the Road Traffic Exemptions (Special Forces) (Variation and Amendment) Regulations 2011(a) when used in accordance with regulation 3(5) of those Regulations. 3. The one-way system on North Street from High Street to Ile Court is temporarily revoked as specified in schedule 2 to this Order. From its junction with Silver Street to its junction with Ile Court. From its junction with High Street to its junction with Ile Court. d) because of the likelihood of danger to the public, or of serious damage to the road, which is not attributable to such works. ILMINSTER COMMUNITY NOTICEBOARD is now up on the wall by the ATM at Tesco and ready for use. In order to keep the board impartial and unbiased, no religious or political notices are permitted. Please note that when demand for space is high, in order to give a range of organisations an opportunity to use this space, we may only keep posters displayed for one week. The material should not be business-related, seek to increase business profits or recruit employees. The material should not cause offence to public taste and decency. The materials must include contact details and make clear who has published the information. Notices displayed will be monitored and removed upon expiry date. 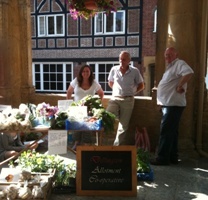 Ilminster Forum runs a Product Market on the first Saturday of every month in Market House in the centre of Ilminster. There is space for around 5 to 6 stall for local producers with a wide variety of products such as free range eggs, honey, outdoor reared pork, traditional bacon, sausages, other meat, bread, jams, cakes and crafts. We will also have one stall for a different local charity / community group each month. If you a local producer interested in having a stall, involved with a local charity or community group who would like to use the community stall, please contact Emma Jane Taylor on 01460 298090 or email us at enquiries@ilminsterweb.co.uk. Clean for The Queen is a campaign to tidy up Britain in time for Her Majesty The Queen’s 90th birthday, which will be officially celebrated in June 2016. The campaign organisers are calling on individuals, volunteer groups, local councils, businesses and schools to do their bit. They are aiming to inspire over a million people to pick litter in their local area and take part in the biggest ever clean-up event over the weekend of the 4,5,6 March. The Ilminster Forum has registered to take part, but rather than litter picking, volunteers will be cleaning street signage. Please free to come and join us in cleaning street signage in your area. Let us know where and when you plan to clean by emailing enquiries@ilminsterweb.co.uk. All that is required is a bucket of soapy water (washing-up liquid), rubber gloves and a sponge. Please do not use any chemicals or abrasive materials. If you live on a busy road keep off the road and wear a high visibility vest. It is also important to ensure that children are accompanied by a responsible adult when taking part in the clean-up. In the case of young children it is advised that there are no more than four children to one adult. Ilminster Forum would like to thank the residents of Ilminster who took the time to complete the Householders Survey, around 30% of households have returned surveys and the data is now being collated and analysed. Surveys aimed at the business sector will be distributed over the next few weeks. The results of all the surveys will be available at a public exhibition later in the year, where Ilminster Forum will again be seeking the views of people in the town. The exhibition will highlight the issues residents and businesses have identified as important, along with a list of potential projects which will help address those issues. Residents and businesses will be asked to comment and help identify the projects to be included in the next community plan. Once this process has been completed Ilminster Forum will update the Community Plan, a document which identifies what residents love about their town and what they think needs improving. It covers important issues that affect residents such as getting about, leisure, working and local facilities. It sets out the needs, hopes and aspirations for the future of Ilminster, with an action plan of projects for achieving those aims. Local Community Groups can then use the evidence collected to help secure grant fund and get support from government bodies. Community surveys are currently being delivered to every home in Ilminster. The Ilminster Forum are appealing to residents to complete this important form and send it back in the pre-paid envelope, so they can capture the views of residents and help make Ilminster an even better place to live. The survey can also be completed on-line https://www.surveymonkey.com/r/Ilminster . 10 years ago Ilminster Forum carried out a similar survey and the results were written up into the Ilminster Community Plan. That document identified the services and facilities in Ilminster that people felt were lacking or needed improving. It also highlighted areas of the town that residents felt could be enhanced. The Ilminster Community Plan was subsequently used as evidence to persuade many organisations to provide support and / or give funding for numerous projects. Information on some of the types of support and / or projects Ilminster Forum is linked to are detailed on our community plan page.